I just released Delphi Code Coverage 0.4 today. It contains mostly minor usability improvements that should make it easier to use and more fault tolerant. Thanks to everyone who has downloaded, tried it out and found issues and suggested improvements! All contributions (yes code contributions too!) very welcome! My ultimate goal with Delphi Code Coverage was to integrate Code Coverage reports with Hudson. In order to integrate the XML reports in to Hudson you will need to download the EMMA plugin for Hudson and configure it to pick up the XML report generated by Delphi Code Coverage. You can also have access to the marked up Delphi source directly from within Hudson by using the HTML Publisher plugin. 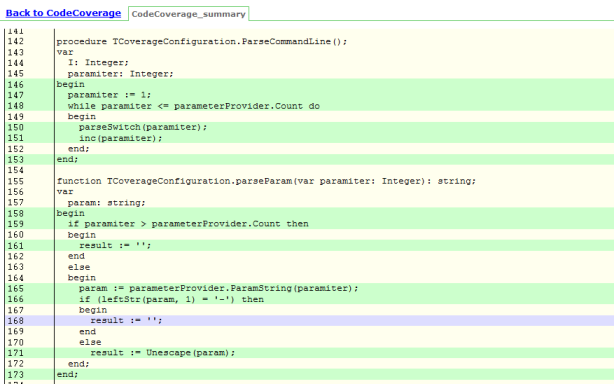 Just make sure you pick up the CodeCoverage_summary.html generated by Delphi Code Coverage. Now, in the past professionally, and recently as a hobby, I have been using Borland/Embarcadero tools ranging from Turbo Pascal for Windows back in 1993 (who remembers TPW 1.0, hands up?) up to Delphi 2010. The Delphi community and the range of free libraries and tools has always been good, if not great. Delphi has been a very “complete” environment for the traditional Windows client and I’d say many Delphi developers probably feel uncomfortable leaving their IDE to use another tool. This has been different for other languages like C++ or Java where weaker development environments have had to be compensated by a range of IDE external tools. As far as a development IDE, Delphi is still very competitive. As software engineering practices have advanced, a lot of the tooling focus has moved out from the developers IDE to the Continuous Integration system. With the advent of good tooling to support CI, the discipline of software engineering has taken a huge step from the closets of University CS departments out to the world of enterprise software development. Many are the development teams who embrace agile practices (code word:scrum), TDD and metrics driven development. One (in my view) welcome aspect of this is that the responsibility for quality has to a very large degree moved to the development team from the (usually understaffed) QA function. The whole point of Continuous Integration is to stay focused on the goal of having a quality product. And today, honestly, I’d think that a development shop who doesn’t use a CI tool like Hudson is seriously behind the times. Now as people start using Hudson to build Delphi projects I know that people (at least I do) desire the same level of quality introspection and visibility in to their Delphi projects as they have with their Java, .Net and C++ projects. If that doesn’t materialize, the viability of Delphi as a development tool will diminish. So – what’s missing you might ask? I understand that Embarcadero has embraced Hudson as a CI tool themselves – why not create and release some Delphi specific Hudson plugins, Embarcadero? So with that way too long prelude (still reading?) – to the point of this article. I have just submitted a new open source project to Google code called Delphi Code Coverage and it is to my knowledge the only free code coverage tool for Delphi. I’ve had this tool lingering on my hard drive in an unfinished state for a year and decided to spend a few hours to polish it up well enough to release it to the world. The inspiration comes again from the Java world where I have been using Emma as my code coverage tool of choice for quite some time. Delphi Code Coverage is a command line tool that will run your executable and using the accompanying detailed MAP file keep track of what source lines were executed. This command line will generate 4 html files, three for the units you supplied and one with a summary for all the supplied units. More details on the usage is available on the Google code site. That’s all folks for now. I hope you give the tool a spin and let me know what you think! The fix: remove jsp-api-2.1.jar from the WAR’s lib directory. Exactly why this works I don’t fully know, just guessing that including it somehow blocks Tomcat’s own jsp-api.jar. Hudson is a tremendously popular open source Continuous Integration tool mainly used for Java based projects. There is evidence that the Delphi community is picking up Hudson as a build tool as well (Hudson is built in Java) and even rumblings about Embarcadero themselves using Hudson to build Delphi. I started using Hudson about a year ago in my day job as a step in organizing the build process for a bunch of Java projects that didn’t have an automated build and I have found it to be a tremendous help, not only in coordinating a team effort but also on a personal software process level, i.e. even if you are a single programmer on a project, I can guarantee you that you will see the benefit of using a CI tool like Hudson. As I was getting totally smitten by Hudson in my day job, my hobby project in Delphi was suffering. Even though I was using Subversion and had automated build scripts and being a single developer I still found (my own) release process to be ad-hoc and brittle. So, enter Hudson to build my Delphi project as well. Since I am hoping that increased usage of Hudson in the Delphi community might lead to some new cool Delphi specific plugins from the Delphi community, I decided to write this little introduction. Are there any prerequisites to start using Hudson? Virtually none – as you will see later on in this post, if you can write a few lines of batch script you are good to go. Well, maybe we should say that it is a pre-requisite to use one of the supported source code management systems(SCM). If your SCM is not supported, chances are you should switch (yes, it cannot be a popular SCM you are using…). The first step is installing Hudson on a machine (if you have no other machine, your development machine will work fine). We shall not spend any words describing that since installing Hudson is so easy it should be set as an example for other systems! The third step is to link the job to your Source Code Management system. Out of the box, CVS and Subversion are supported, for all others, you need to first install the appropriate SCM plugin. Hudson will place all the files from the SCM in to a “Workspace” in the filesystem from where the project is built. call "C:\Program Files (x86)\Embarcadero\RAD Studio\7.0\bin\rsvars.bat"
msbuild  /p:Win32LibraryPath="$(BDS)\lib;$(BDSUSERDIR)\Imports;$(BDS)\Imports;$(BDSCOMMONDIR)\Dcp;$(BDS)\include;" /t:build /p:config=Debug /verbosity:detailed "MyDelphiProject.dproj"
Test your batch script from the command line. If it works, you are ready to call this batch file from Hudson. Remember to check it in so that Hudson can fetch it from the SCM! Now press SAVE on the bottom of the page. Now you are ready to build your project. Select “Build now” and see if you get a blue dot for your project. If you get a red dot, go to the console output for that build to find out what happened. So what have we done so far? We have made sure that Hudson can; 1. Fetch the source from the SCM. 2. Build it successfully. Now we need to make sure we live up to the “C” in continuous integration. This is done by configuring the “Build triggers” for the job to poll the SCM for changes. I usually set it up to poll every 15 minutes, but YMMV. That’s all folks! May you all be successful in using Hudson to build your Delphi projects! If you, like me (who is doing this as part of the Coherence Incubator), are dabbling with Java reflection, you might have run in to the case of trying to match a parameter list to available constructors or methods for a Java class in order to construct objects using reflection. There is an easy option available in getDeclaredConstructor (and similarily for finding a particular method: getDeclaredMethod) which takes an array of Class objects and maps it to a constructor’s signature. The problem with this admittedly very convenient method is that it does an exact match between the Class for the formal parameter list and the Class of the actual parameter. So if you have a parameter that is of a subclass of the formal parameter, getDeclaredConstructor won’t find it! But look no further, as part of the latest release of the Coherence Common Incubator project you will find getCompatibleConstructor to the rescue! Below you will find an extract from ReplicationHelper.java that will return a constructor that matches both subtyped parameters as well as primitive types. * Get a compatible constructor to the supplied parameter types. …you should read the always (well, I find him amusing most of the time anyway) entertaining Joel Spolsky’s introduction to Mercurial. I’m currently using Subversion (at home) and Perforce (at work), both quite similar tools, but I am getting more and more enticed to go the Mercurial route instead. If you are looking for hosted Mercurial repositories, there seems to be two good choices in Bitbucket and Kiln.